Can the SWCD Fund My Conservation Project? This posting of Monthly Plan-it is the monthly report of the Clackamas Soil and Water Conservation District’s Conservation Planning Program. Measures were not taken to protect the soil from erosion during development. There are many factors that conspire against keeping your soil covered. Weeds, drought, fire, tillage, rodents, unimproved roads or animal turnouts are all common factors that can result in areas of bare ground that are susceptible to erosion. Erosion can take place anywhere on your property where soil is uncovered and water is allowed to move across the surface of the ground as runoff. Steeper slopes are generally more vulnerable to soil erosion. As slopes increase so does the speed at which water flows through your property, increasing the amount of soil it can carry with it. If you have very steep ground or soils that easily erode, you may also be at risk for slope failures. Steep slopes are common in our area. Heavy winter rains can saturate soils. When water pressure builds between soil particles, the soil can liquefy and trigger a landslide on steep slopes. If you are not able to provide temporary or permanent cover on susceptible sites, even light winter rains can remove soil from your site. Cover can take many forms, from live or dead plant material to commercial or engineered solutions. Planting vegetation is the most widely used practice for erosion control and prevention. Vegetation provides additional benefits including improvement of soil health and structure, increased of water infiltration, and runoff reduction. Plantings can also provide habitat for wildlife species if the right plant species are selected. As great as plants can be for erosion control, getting them to grow and thrive before the winter can be difficult. When a planting window is missed, there are commercial products such as geo-synthetic tubes, compost berms and other temporary solutions that can be used to slow water down and prevent soil and other pollutants from reaching streams. Even something as simple as spreading a layer of weed-free straw a few inches thick can result in significantly reduced rates of erosion. Clackamas SWCD’s conservation planning staff are available to help you detect problems and identify solutions for erosion problems. We can recommend a variety of techniques that conserve soil resources and reduce or eliminate pollution in runoff. Contact us and we’ll get you in touch with a conservation planner who can work with you to identify and offer solutions to erosion issues on your land. Streambank erosion is a natural process and, in an undisturbed stream, it usually happens slowly over time. However, once a stream is disturbed and plants along streambanks are removed, this process may speed up to alarming rates of erosion. Increased flow in our many rivers and streams due to winter storms and snow melt can increase erosion along areas that are already unstable. This can lead to property loss, poor water quality, and loss of healthy conditions for fish. We have all seen erosion cause property loss with large chunks of bank slumping and toppling into the stream following each large rain storm. One way to repair erosion problems (or prevent them in the future) is to plant trees, shrubs, and grasses in the area along the stream known as a riparian area. Healthy plants covering the streambanks and the area next to the stream will serve to protect water quality, provide habitat for fish and wildlife, and stabilize streambanks. The best time in our region to plant trees and shrubs is when they are not actively growing, typically between November and March. Since trees and shrubs are best planted during winter months, this is a good time to start planning your streambank project. When deciding what plants to use, consider using native plants. Native plants are adapted to our local soils and moisture conditions, and provide food and habitat for our native wildlife. along your streambank. It includes a list of common Willamette Valley native plants suitable for planting along streambanks. Some of the best shrubs for the riparian area are native willows like Pacific and Scouler’s willow or Red Osier Dogwood, which can be recognized by its bright red stems and small white flowers. Native trees to consider are Oregon Ash and Red Alder. Willows and dogwood form dense hedges with fibrous roots, which can greatly reduce water speed, in turn slowing down erosion. Oregon Ash also has a very strong root system that is excellent at holding soil in place. Read our recent article on Native Plant sales in our area. While adding native plants typically reduces streambank erosion, in more extreme erosion cases, such as when banks are steep, planting trees and shrubs may not be enough to stabilize the streambank. When this occurs, other techniques may be necessary to control the erosion. See the above article for resources relating to erosion on steep slopes. If you live in an area with beaver, mice, or other wildlife, it may be necessary to protect your plantings with tree protection tubes. Keeping the ground around each planting free from competing grass and other plants will also help reduce wildlife damage. This document is a comprehensive guide to planning and implementing a streambank restoration project using native plating. It includes information on pre-planning, plant selection, site preparation and weed suppression techniques, planting techniques, maintenance, and project evaluation. Since the fall of 2015, Clackamas SWCD has been working closely with private landowners and partner organizations in the Molalla area to restore native habitat along the Molalla River and one of its tributaries, Cedar Creek. Molalla River Watch (MRW) invited the Clackamas SWCD to accompany them on visits with a landowner who was fighting English ivy. We worked closely with the landowners to provide technical expertise and to develop a Conservation Plan for Riparian Restoration. The conservation plan was used by MRW to aid in applying for an Oregon Watershed Enhancement Board (OWEB) Small Grant to fund the completion of the resulting riparian restoration project. In the spring of 2016, MRW was awarded the OWEB Small Grant and they hired a restoration contractor to implement the project. At the same time, and per their request, the SWCD worked closely with the landowners and Oregon Department of Fish and Wildlife (ODFW) to develop a Riparian Lands Tax Incentive Program (RLTIP) Plan. The plan was approved by ODFW and Clackamas County in 2016 and now the landowners are receiving a tax exemption for fish and wildlife habitat in the RLTIP habitat project area. Our District has been providing technical assistance for this project over the past 2.5 years and the project area will be planted with roughly 1900 native bare root plants this coming spring! Please visit the Molalla River Watch newsletter links below for more information about this project. 4 – Can the SWCD Fund My Conservation Project? We get asked this question often, and for good reason. Making changes on the land takes time and investment to be successful. The answer to this question also takes time and investment to answer as there are several factors that influence project funding decision. This article explains in general terms the factors by which the SWCD makes funding decisions. 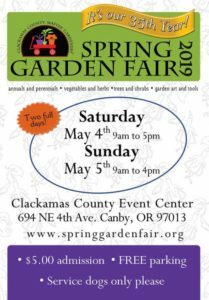 Clackamas SWCD provides conservation support in many ways to the residents of Clackamas County. We primarily provide technical assistance to folks who want to adopt management changes that conserve resources. Many times these changes benefit residents not only in conservation terms, but also in economic terms. Conserving resources can save time and money. When resource management changes result in conservation impacts that will provide a significant public benefit, there are opportunities for the SWCD to provide funding to implement the projects and practices we are recommending. These public benefits can be improved water quality, increased efficiency in water use, and improved wildlife habitat, among others. We can’t fund every project that comes our way because the need far outweighs the available resources. SWCD project funding comes from several sources including property tax dollars from a permanent rate assessment in Clackamas County and from grants we apply for from government agencies and foundations. As a result of this limited funding we have to ensure that we are getting a significant public benefit from the projects we invest in. Our pathway to providing funding for conservation projects is paved through the development of conservation plans. Conservation plans allow us to both document the conditions that are negatively impacting resources on a property and also to develop detailed solutions that we feel will result in solving those concerns. They also quantify the outcomes we look to achieve and identify if there is significant public benefit. Without a conservation plan it becomes difficult for us to justify the use of public dollars for projects that may also have economic benefits for landowners. We need to be able to clearly identify the public benefit that will result from a project. As such the conservation planning process is the foundation of the assistance we provide. Developing a conservation plan takes some time, and the complexity of the plan needs to match the complexity of the problems we encounter. Many folks just want a bit of technical information to make changes on their own. Others who want greater assistance – be it technical, financial, or both – must invest their time and be willing to make decisions within the conservation planning process. One other factor that greatly affects how we fund projects is how we have to plan for our spending. Our fiscal year runs from July 1st through June 30th, and as a taxing district, we must follow mandatory budgeting requirements to spend money. As a result of those requirements, our board must adopt the budget ahead of the coming fiscal year. The impact of this process is that we need to know which projects we will fund and how much they will cost at least six months before the fiscal year that they will be implemented. In fact this month (January 2018) we are busy preparing our budget for July 1, 2018 through June 30, 2019. What that means for our customers is that we need to have a conservation plan developed and ready to implement up to 6-18 months in advance of the proposed projects. Add to that the time it takes to develop a solid conservation plan and the time frame increases by that time increment. That’s not to say that we don’t have any flexibility in that time period, as projects sometimes come in under budget or need to be postponed or canceled, creating space for other opportunities. But for most projects it means that we need to have patience and a well-developed plan to make sure the window for funding opportunity is maximized. So as you work with our conservation planners to solve issues that are causing you concern on your land, there may be funding available to help you. However, there is a process that we must go through to determine whether the funding can be justified. We also must be able to include it in our budgeting process. The best way to meet these requirements is to work with one of our planners to develop your conservation plan.